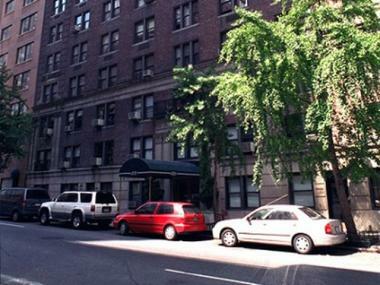 George Kogan was gunned down outside his mistress' E. 69th Street apartment in 1990. MANHATTAN SUPREME COURT — The sentencing of a Manhattan woman who confessed to hiring a hit man 20 years ago to kill her husband was delayed by prosecutors so the couple's son could finally face his mother in court and speak of the torment she unleashed on his life, DNAinfo has learned. Barbara Kogan, nicknamed the "Black Widow" in the tabloids, was the long-time suspect in the contract killing of her estranged husband. She finally admitted to plotting the murder on April 29 as part of a plea deal her lawyer claimed was made to avoid facing down her two sons in court. The plea came two decades after George Kogan was gunned down in front of his mistress' Upper East Side apartment as arranged by his crazed spouse, who collected a $4.3 million life insurance payout. Kogan, 67, was scheduled to receive a promised sentence of 12 years in prison on Wednesday, but prosecutors requested an adjournment to allow her son, Scott Kogan, to make a trip to New York from Puerto Rico for the sentencing, Barbara Kogan's attorney Barry Levin said. The new date of sentencing is June 4, when Scott Kogan is expected to describe how his mother's actions have harmed his family. It will not be the first time the son will be in court discussing Barbara Kogan's possible role in his father's murder. Scott Kogan told jurors his mother was too preoccupied with finances at the time of his father's death to care about funeral arrangements while testifying in the 2008 trial of Manuel Martinez, a lawyer convicted of helping Kogan set up the hit, according to reports. Barbara Kogan was only interested in speaking about her husband's will as the rest of the family mourned the loss, her son reportedly testified. Kogan was apparently already obsessed with getting her husband's money. She increased the value of his life insurance policy without his authorization and made phone calls to the insurance company in preparation for his homicide. The insurance company, suspicious of foul play, took Kogan to civil court before handing over the money. Only Kogan and Martinez have been prosecuted in connection to George's murder. The gunman was never identified. Kogan reportedly took the plea to save her two sons from having to testify.